Over the past few years, travel restrictions have become tighter and tighter, making it more and more difficult to carry all your fashion and beauty essentials with you while globetrotting. Between decanting your fave moisturiser into 100ml bottles and making shortlist after shortlist of which items will make the cut and be squeezed into the extremely limiting 20cm x 20cm clear plastic bag, its easy to forget something important, and end up scouring foreign supermarkets for something to sort out your dark circles. 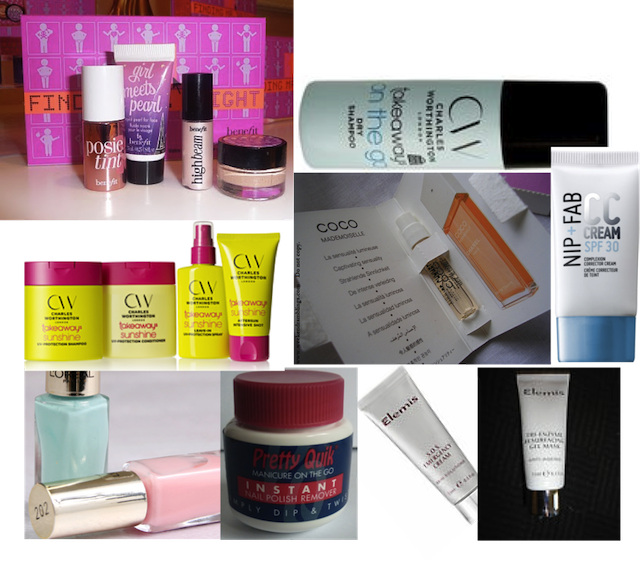 Luckily, I have been looking around at the best mini versions of products available at the moment, and have started to compile a capsule collection of mini travel beauty products that you can take just about everywhere, and some of them are completely free! Starting with skincare, you can often get mini versions of your usual products free when you purchase two or more items from the range, particularly in department stores. Elemis have been running promotions offering FIVE free 15ml products, so you won’t have to upset your skin by switching to a different brand while you’re travelling. Products I tried through the promotion included the Tri-Enzyme Gel Resurfacing Mask, which restores the skin’s balance of sebum levels, and the SOS Emergency Cream, which is great for holiday breakouts. I have also recently ditched BB cream and given CC cream a try. CC stands for complexion corrector, and I have to say I am quite impressed. It really evens out your skin tone and gives you a flawless look, perfect for natural daytime look. Try Nip and Fab CC Cream – its only 40ml so perfect to pack away for travelling! Looking after your hair when travelling can also be tricky. Charles Worthington Takeaways are great for on the move, and include shampoos, conditioners, serums, and of course, the trusty dry shampoo (which in my experience is better than Batiste). The sunshine range is great for holidays as the sun can really dry out your hair, but these rehydrate and add shine, while protecting from the heat. As for beauty, trying to work out how you’ll cope without your entire makeup bag on holiday is quite the chore, and I almost always make the wrong decisions! Benefit offer some great beauty sets which contain tiny versions of their products, which are perfect for packing. The Finding Mr Bright set costs around £28 and contains a mini Pose Tint, Erase Paste, High Beam and Girl Meets Pearl, which all give you a radiant shine. I am a sucker for nail polish – I counted that I own a total of 89 – so parting with my collection while travelling is tough. Luckily, L’Oreal have launched their tiny bottles of colour riche polish, which pack really well and come in loads of great colours. Their small, cuboid shaped bottle mean you can still take a range of colours away with you, without using up half of your luggage weight allowance! If you’re a serial nail colour switcher, you need to pick up a Pretty Quick nail polish remover pot. It contains a sponge soaked in nail polish remover, and fits in your handbag unnoticed – perfect for removal on the go. For me, perfume is an absolute necessity, but the bottles can be large, heavy, and besides anything else, you don’t want to go and leave your £60 bottle of Chanel in your hotel room when you leave. A great thing to do is ask for a few samples at the beauty counters in stores. Often they can give you a tiny 5ml spray bottle of your favourite fragrance, so you don’t have to worry about taking all your elaborate bottles away with you! Perfect! Here are some of the top picks to get your travel collection started! • Charles Worthington Takeaways Sunshine, from £1.99, Boots.